SilverWare is an award-winning POS solution that delivers end-to-end Point of Sale technology for the hospitality industry. SilverWare POS provides online and mobile point-of-sale solutions that cater to the needs of small-medium businesses and large enterprises. Unlike many modern POS systems available in the market, SilverWare Avrio POS offers never-before-seen visual elements integration that makes table management processes such as zoom, sectioning, floor plan rotation, table joining, and graphical gender more innovative and productive. The platform provides modular services including inventory management, customer management, retail accounting, and others. SilverWare POS can be implemented and maximized in a variety of major industries including retail and wholesale, automation and manufacturing, e-commerce, restaurants and hotels, and others. SilverWare Avrio POS delivers a feature-rich on-premise solution for small to mid-sized companies in the hospitality industry. This robust Point of Sale software comes with features and tools that easily cover many aspects of managing a hospitality business, including Customer Relationship Management tools, real-time reports and analytics, precise inventory management, and labor and time management to improve efficiency and communication. SilverWare POS is an ideal partner in performing unparalleled table service, thanks to its visual ordering experience and innovative table management features such as zoom, sectioning, floor plan rotation, table joining, and graphical gender-based ordering and tracking. 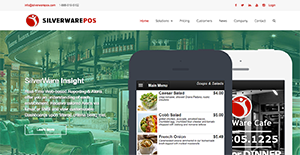 Quick service businesses will find the flexibility of SilverWare POS very helpful. Users can tailor its single-screen layout to empower staff to immediately and efficiently process drive-thru, takeout, and eat-in orders. SilverWare Avrio POS makes it easier for management to perform their tasks efficiently, thanks to its real-time updates and smooth integration with a variety of devices. Employees can be more focused on serving guests and addressing their every need, resulting in a more positive dining experience. For added efficiency, checks can be printed directly from the mobile device. This means more time is saved for both servers and diners. Other aspects where SilverWare POS excels are mobile table-side ordering, bar and nightclub solutions, in-store guest ordering, and online ordering to name a few. Items print to the kitchen or bar printers appropriately. There are popular and widely used systems in each software category. But are they essentially the best fit for your company’s specific requirements? A trendy software solution may have thousands of customers, but does it provide what you require? For this reason, do not blindly spend on popular systems. Read at least a few SilverWare reviews and think about the aspects that you wish to have in the software such as the cost, main functionality, available integrations etc. Then, choose a few apps that fit your requirements. Try out the free trials of these apps, read online reviews, get clarifications from the maker, and do your investigation thoroughly. This exhaustive research is sure to aid you select the best software solution for your company’s special requirements. How Much Does SilverWare Cost? We realize that when you make a decision to buy POS Software it’s important not only to see how experts evaluate it in their reviews, but also to find out if the real people and companies that buy it are actually satisfied with the product. That’s why we’ve created our behavior-based Customer Satisfaction Algorithm™ that gathers customer reviews, comments and SilverWare reviews across a wide range of social media sites. The data is then presented in an easy to digest form showing how many people had positive and negative experience with SilverWare. With that information at hand you should be equipped to make an informed buying decision that you won’t regret. What are SilverWare pricing details? What integrations are available for SilverWare? If you need more information about SilverWare or you simply have a question let us know what you need and we’ll forward your request directly to the vendor.